A huge collection has evolved of Titanic Pictures showing Titanic facts from Titanic furniture, Titanic necklace, Titanic food menus, Titanic wreck , even Titanic deck chairs ,Titanic Tickets ,Titanic deck plans literally anything to do with Titanic. To get a sample these we have selected two of the first three below which show the Titanic Lifeboats that carried the Titanic survivors. Originally, a lifeboat drill was scheduled to take place on board the Titanic on April 14, 1912 - the day the Titanic Ship hit the iceberg. However, for an unknown reason, Captain Smith canceled the drill. and many have been left to believe had the lifeboat drill taken place, more lives could have been saved. There were not enough lifeboats to save everyone on board. Indeed as the tragedy evolved most of the lifeboats that were launched off the Titanic Ship were not filled to capacity. For instance, the first lifeboat to launch, only carried 24 people, despite having a capacity of 65 so 41 places were still available. However, it was Lifeboat 1 that carried the fewest people - Titanic facts show only seven crew and five passengers (a total of 12 people) despite having a capacity for 40. That left 28 other people who could have joined that lifeboat and increase the number of Titanic survivors. Below are some pictures of the Titanic lifeboats and Titanic images of the gym on board the ship. When Captain Smith realized the seriousness of Titanic situation after striking the Titanic iceberg, the order was given to uncover the lifeboats. The captain then went to Titanic wireless room. Inside, Marconi operators, Harold Bride and Jack Phillips were just discussing the possibility of something being wrong with the Titanic ship. They had felt the jarring vibration and noticed that the ship's engines had stopped. It had been a very busy day for the two radio operators with all the passengers personal messages going out. Phillips had just finished sending messages to Cape Race. The door opened and the two men turned to see Captain Smith standing there. "We've struck an iceberg and I'm having an inspection made to see what it has done to us. You had better get ready to send out the call for assistance, but don't send it until I tell you." A few minutes later the captain returned. It was now 12:15 A.M. Sticking his head in the doorway he said, "Send out the call for assistance!" Phillips asked the captain if he should send out the international call for distress, to which Captain Smith replied "Yes, at once!" 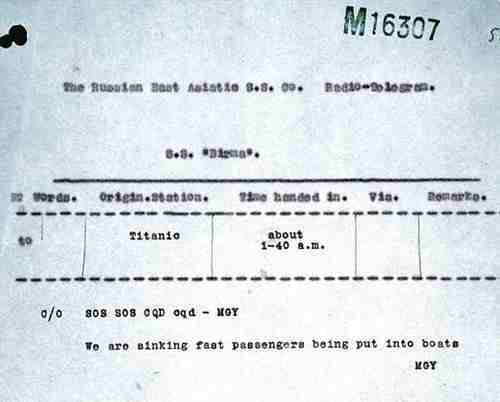 Smith handed Phillips a slip of paper with Titanic's current position on it. Below are some pictures of the Titanic Marconi Room and the signal sent by the operator. Also some Titanic images of the reading and writing room and cafe which shows some of the Titanic furniture aboard the ship. The Wireless Room on the Titanic where the wireless operators would have sent out the final message for help. Pictures of the writing room and the cafe.